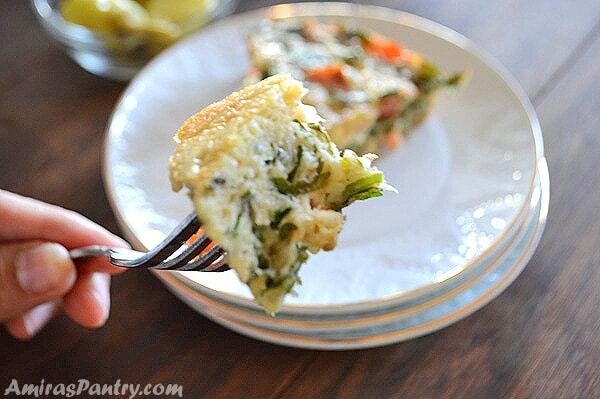 Easy breakfast frittata recipe made in the oven. Herbs loaded, very flavorful frittata made with just a handful of ingredients. 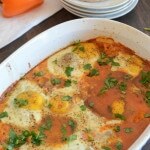 This is the Egyptian version of the famous Italian frittata, this dish is called Egga. 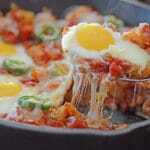 Caramelized onions, eggs, herbs, flour and tomato are combined to make this unforgettable dish. Bake in a pie pan, muffin tin or Pyrex baking dish. 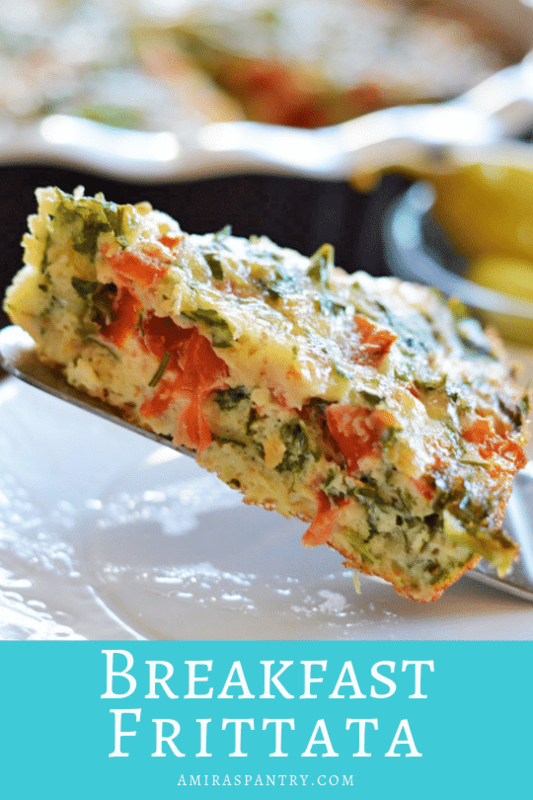 Great for breakfast, lunch or for weeknight dinner . Perfect for a weekend brunch recipe as well. This post has been updated from the original July 2016 . Last updated January 2019. Frittata or Egga dish is very popular in Egypt, it is as popular as ful, everybody eats it poor or rich, although I highly doubt that the poor are able to afford it anymore as egg prices skyrocketed recently. I remember that I hated this dish when I was little, whenever my mom made it, I just turn my head away and refuse to eat no matter how she tried to convince me. So I was very hesitant to try making this dish as I was almost sure it will go to a waste and nobody will eat from it. Luckily, this did not happen. The reason I hated the egga dish before was that, it had that bitter taste that I could not tolerate, a friend of mine suggested that this might be to over sauteed onions. May be mom browned the onions- as my late father liked everything deeply fried- to the extent that it gave this bitter taste to the whole dish. So, I only sauteed my onions until they were light golden and to my surprise I did not get that taste anymore. Is frittata good for you? 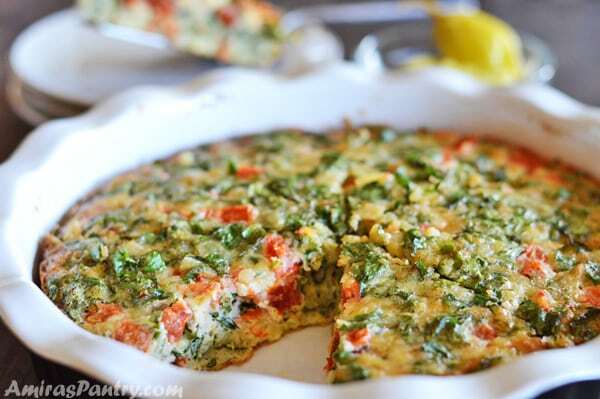 Frittata is packed with protein and vegetables, it has 3 tablespoons of flour though. I f you would like yours without the flour then feel free to add one or a combination of mozzarella cheese, heavy cream, half-and-half, almond flour. 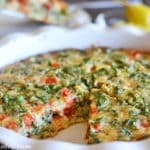 What are the ingredients in a frittata? For this dish you saute a lot of onions and then wait for it to cool down then add eggs, chopped herbs, flour, baking powder then season well and pop in the oven for about 30 minutes, let it cool down and serve. My mom , and most of the moms in Egypt, used to make this dish greener than how I made it, but I was afraid that my kids will not touch it if it is greener than this, and I was positive that if I made it greener, probably my youngest will ask ” is this the green eggs and ham of Dr. Suess ?!! !” :/. So to be safe I decreased the amount of herbs by almost 50%, so if you want the authentic Green egga, feel free to double the herbs. Feel free to use whatever herbs you have but cilantro is essential. Some people do not use dill, others do not use parsley or use more/less of a certain herb . I also added some cubed tomatoes just to give this dish some color, but this is not authentic. Next time I am going to try adding some bell pepper as well, I bet this will give it a nice taste and smell. You can serve this frittata warm, room temperature and sometimes cold. I do not like mine cold from the fridge, for us it should be at least room temperature. Put the onion in a bowl, set aside and let it cool down completely. Add eggs over the onion and mix. Now add all the other ingredients, fresh herbs, spices, flour and baking powder. Pour the mixture in a well buttered pie pan/ muffin tin or a baking dish. Bake in a 350F oven for 30 minutes until totally done. 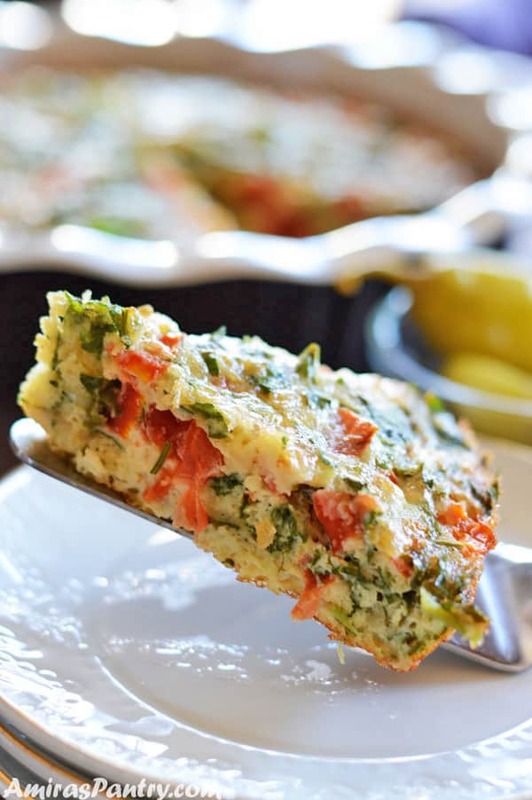 To make this frittata in a muffin tin, you need to butter the tins very well, this muffin tin is great, you do not even need to butter it. I hope you’ll like this recipe and please if you make this recipe, snap a pic and hashtag it #amiraspantry — I love to see your creations on Instagram, Facebook, Twitter! Don’t want to miss a recipe? Sign up for the FREE Amira’s Pantry newsletter delivered to your inbox with lots of tips and surprises! 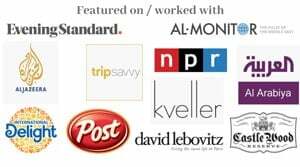 And stay in touch with me on Facebook, Twitter, Pinterest, and Instagram for all the latest updates. 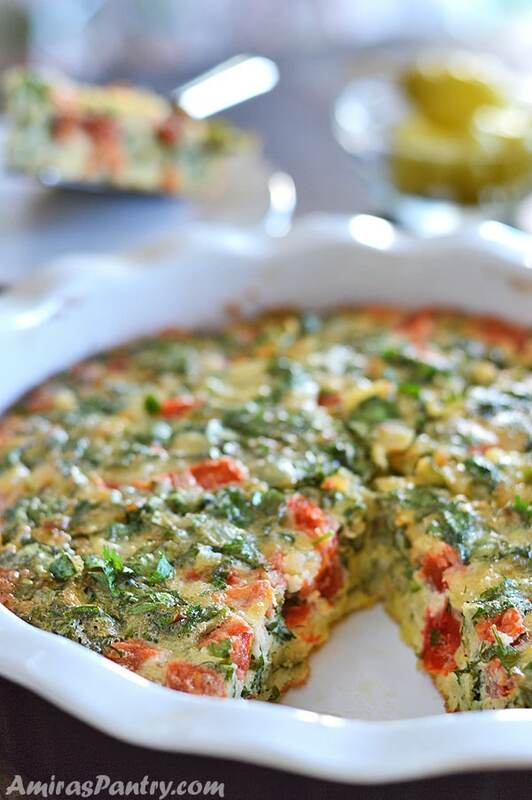 A breakfast Frittata is an easy, fast and hearty egg dish that is loaded with herbs and perfect for just about any meal. Beat the eggs with some herbs, flour, onions and season with salt and pepper then bake in the oven. 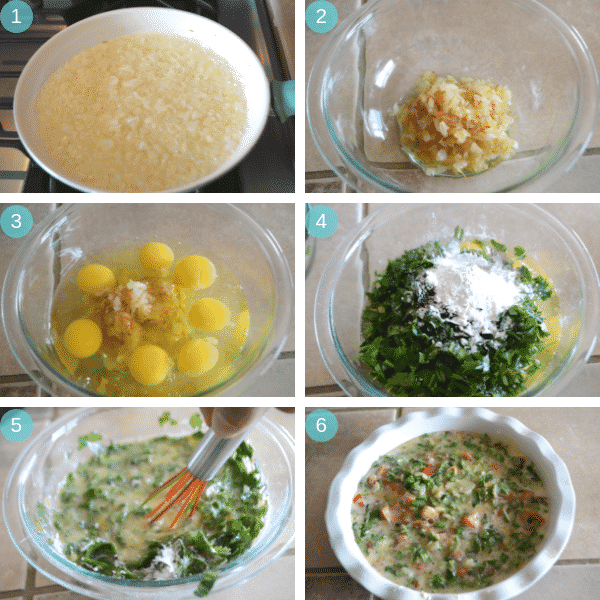 The result will be a dish that hovers between quiche and omelet. A fancy breakfast frittata with a twist. Loaded with fresh herbs, flavorful and very filling. 2 1/2 cup onion coarsely diced, about 2 medium onions. In a pan over medium heat, saute the onion until it reaches light golden color. Add all other ingredient to the onion and mix well. Pour in a well prepared oven dish. Pop in a 325F oven and bake until done. Dill is optional , not many people add dill to their egga dish, other herbs are to your liking. Some people like adding cilantro more than parsley or vise versa. Can never resist a frittata! We like them for dinner, but they’re terrific for breakfast, of course. Lunch, too. Thanks! 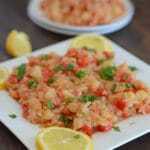 I make this often as it is quick, easy, tasty and can be eaten hot or cold. Sometimes it is traditional with cilantro, parsley and onions but often with sweet peppers, sometimes chopped aubergine or courgette sometimes cheese. It’s very adaptable, much to my Egyptian family’s horror!!! Lol. Any which way……we all like it here in Scotland. Thank you Maryam for your comment. This is indeed a lovely dish that my mom used to make along with fried potato wedges and also fried aubergine. I did not appreciate it much when I was young but now I really love it. How is it going in Scotland, I bet it is lovely there. Interesting – I will give it a try! How can we estimate the number of calories here? Sam, there are quite a few websites that will give you such data, I usually go to sparkpeople recipe calculator. It is a free tool and does not require registration unless you want to save the recipe of course. I’ve also heard about FitDay, MyPlate and NutritionData.… Hope this will help. Thanks for being interested in this recipe, please do come back and tell me how it went with you. I hope you’ll like it. Amira, this looks fantastic! I notice that the ‘standard’ fritatta usually has cheese and milk/cream. Yours is simpler but looks just as good!